Our Sweet Love Story: Back to College! 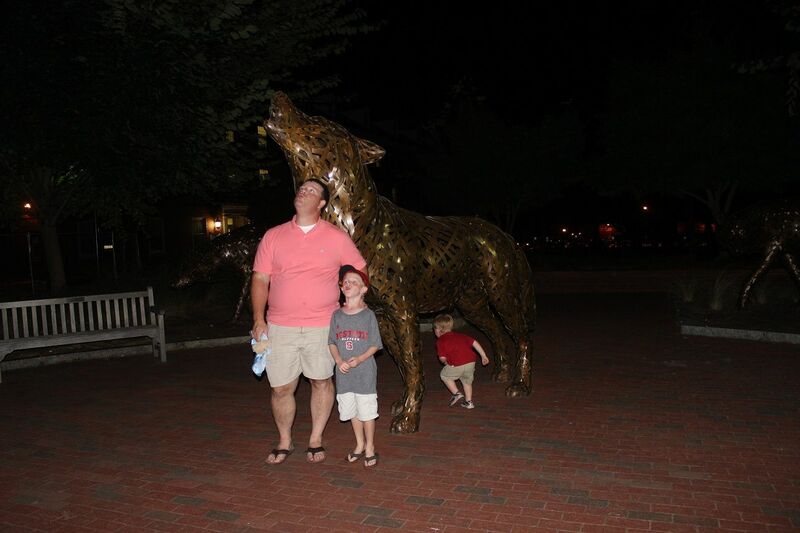 While in Raleigh for the football game, Eddie and I thought we would enjoy taking a little stroll down memory lane. 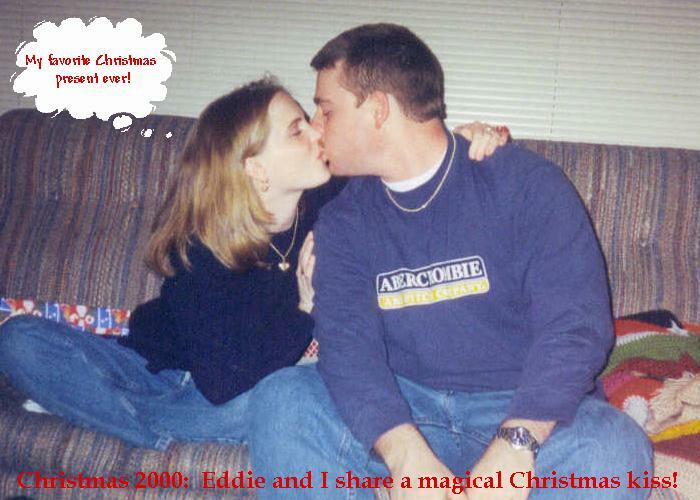 We met in Raleigh in early 2000 while I was a freshman at Meredith College (an all girls' school in the heart of Raleigh) and Eddie was a junior at N.C. State. 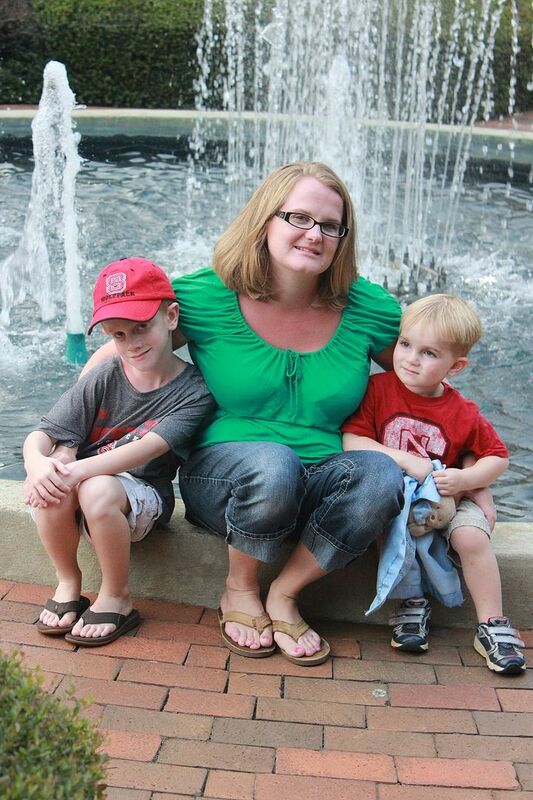 Before I met Eddie, I enjoyed hanging out with friends at N.C. State. My friends from Meredith would head over there almost every night to hang out (you know this had nothing to do with the guys...haha!). A friend I had made the summer before college at my first job was a freshman at State so we would hang out with him and his friends and suite mates mostly. 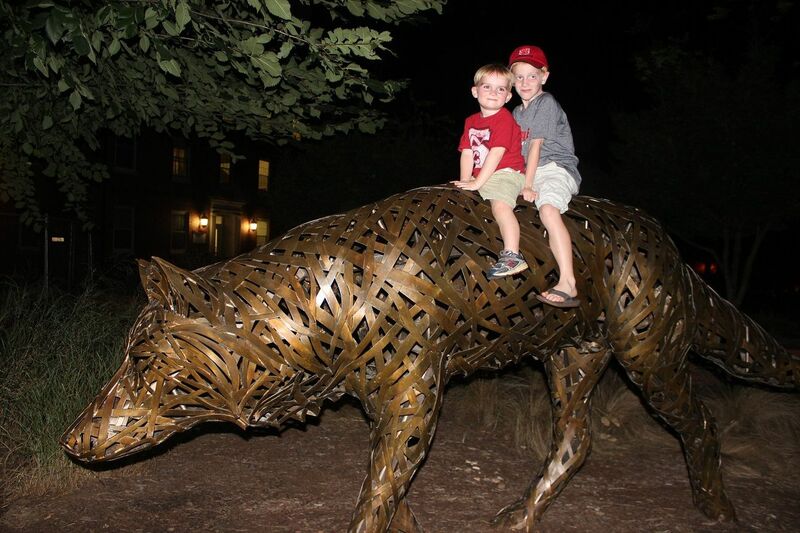 Sometimes we would just spend late nights walking around campus and acting like crazy kids away from home for the first time. Yep, we were those college kids! Thankfully, I met Eddie and settled down so as not to flunk out of college. Hehe! Anyway, these places just bring back great memories for Eddie and I, and we enjoyed showing Evan and Brody some of the fun spots. I just love these State boys! 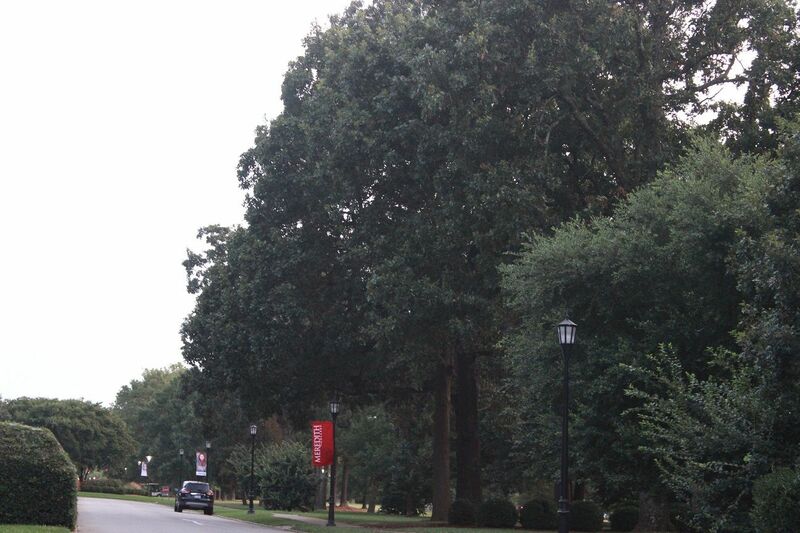 The main drive into Meredith is very pretty with trees lining the street. I should have taken more pictures, but we were ready for dinner. 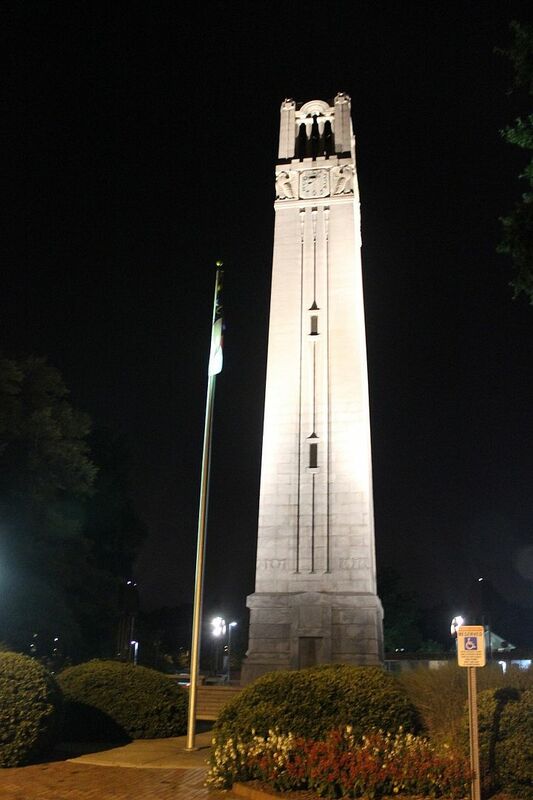 The iconic symbol for N.C. State is the bell tower. Doesn't every school have a symbol like this? 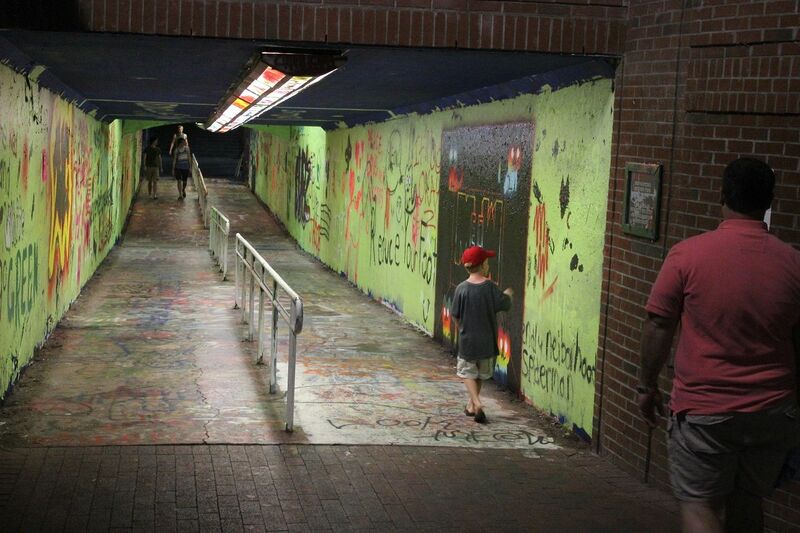 I thought the boys would like walking through the free expression tunnel on campus that goes under the railroad tracks. Just checking out the "art." 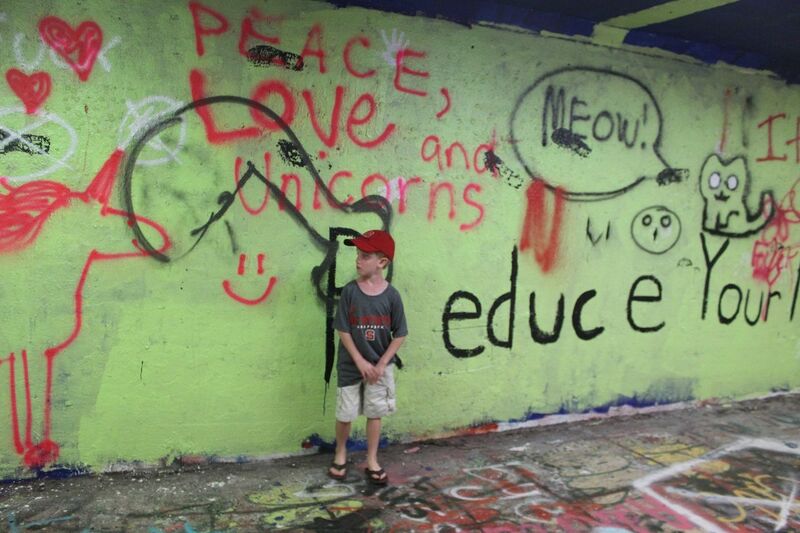 Evan posing with some of the crazy drawings and writings. Brody liked this "doggie" and kept going back to it and barking. 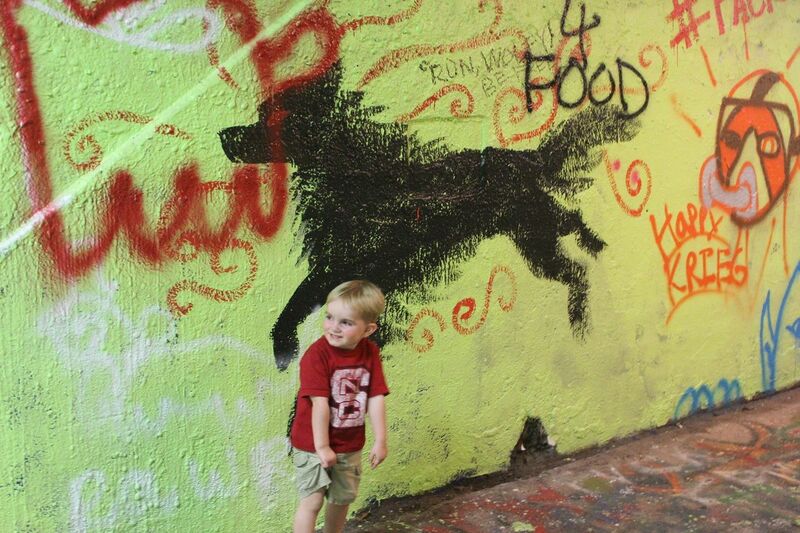 We tried to tell him it was supposed to be a wolf and get him to howl. 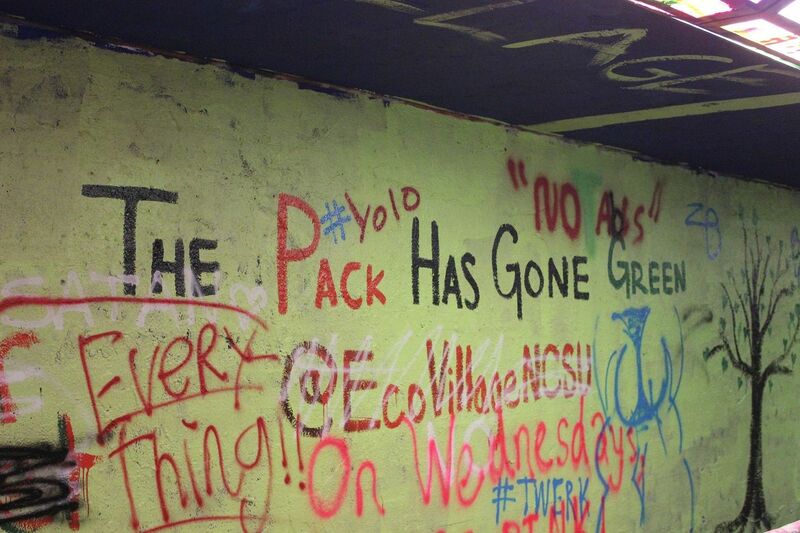 Apparently, going green is big to college kids now. 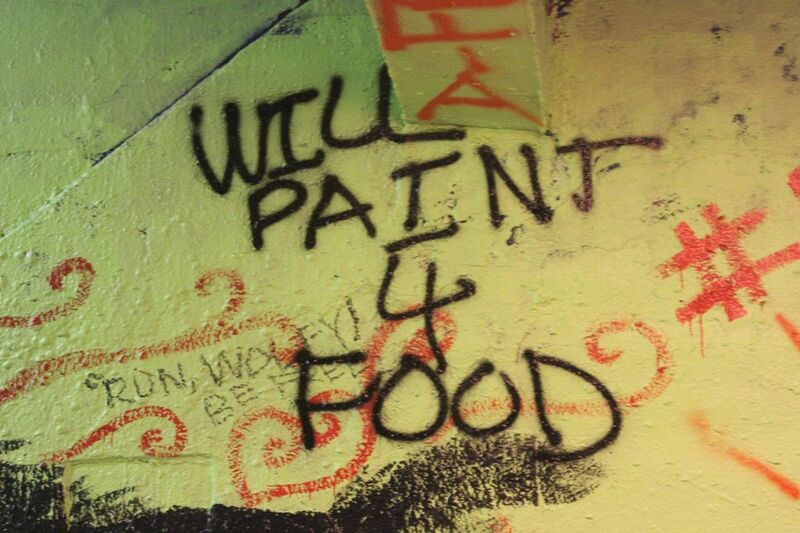 Broke college kids must paint for food. Brody thought this was a wishing tree. 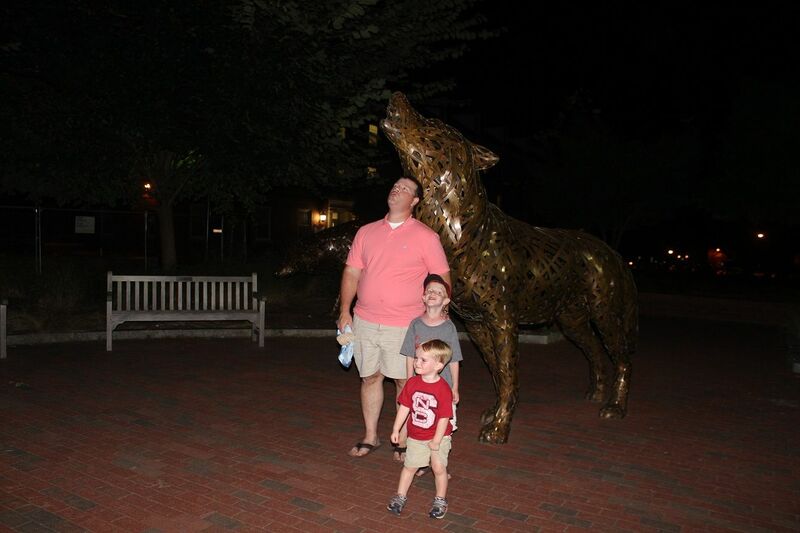 These boys enjoyed howling at the moon with wolves. 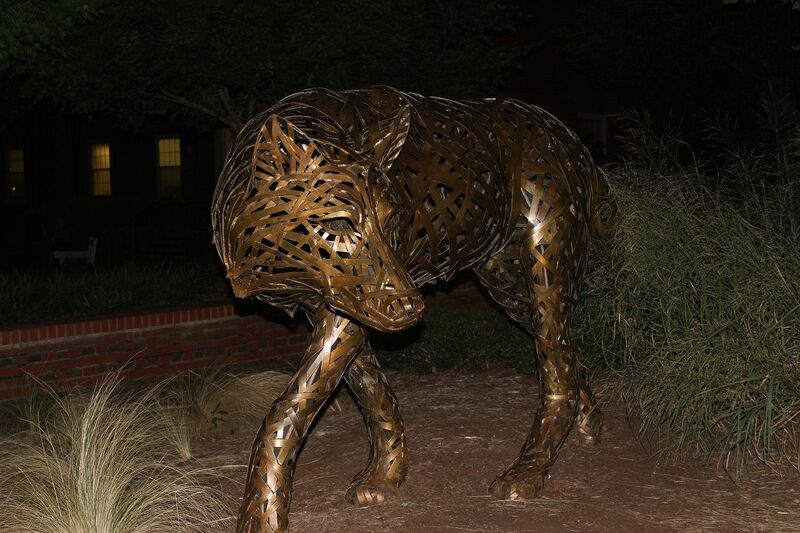 These wolf sculptures were new to us. 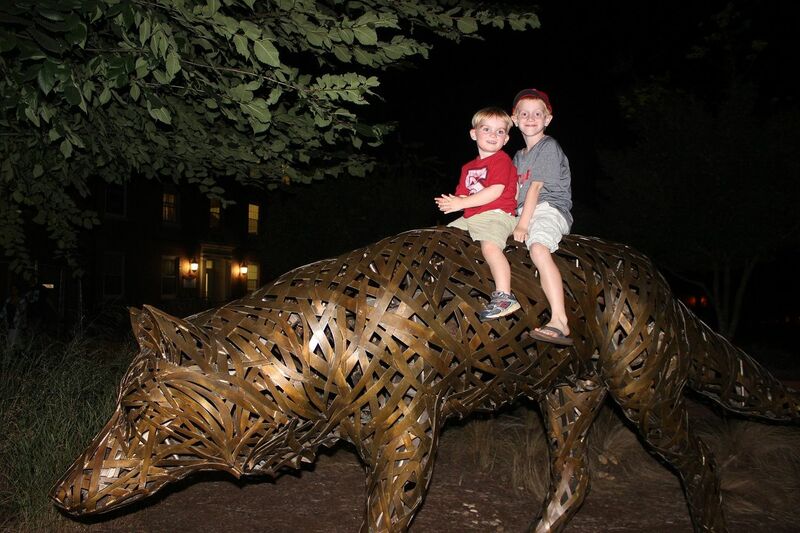 The boys liked riding the wolf. And yes, I had to ride too. I just knew a cop was going to come along while I was on it and arrest me. Haha! In my defense, there were other people on them before us. Me and my little man riding together. 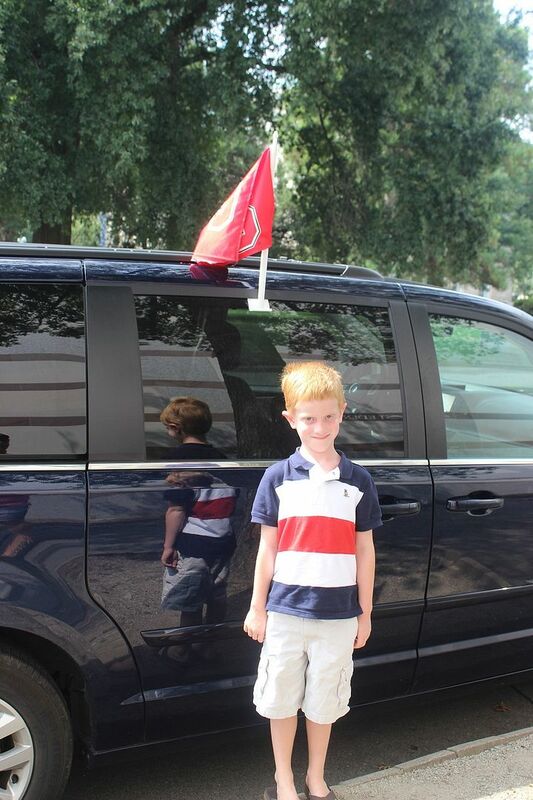 Evan wanted a picture with his State flag. 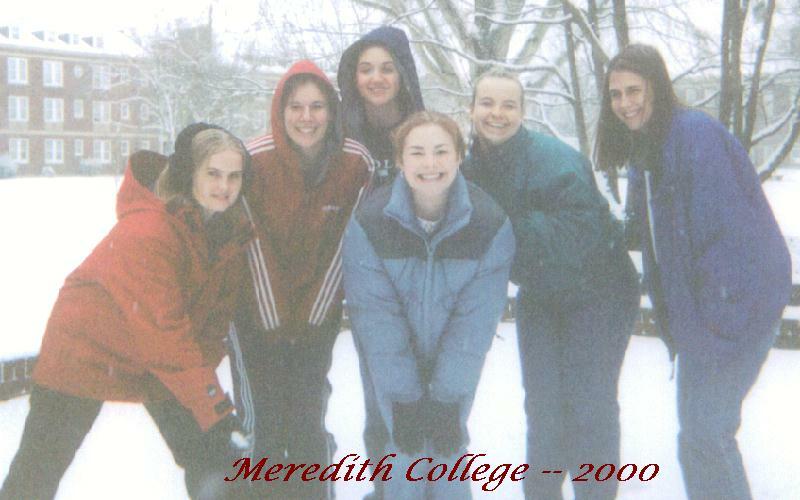 Here are me and the girls after a big snow storm hit Raleigh in January of our freshman year. It was great! No classes all week, and we were snowed in. And this was an early picture of us together our first Christmas. I was really in to putting crazy thought bubbles on photos back then. Ha! Well, who doesn't love a good thought bubble. Lol! I have a few pictures like that too. This post made me smile. I love the pictures on the wolf. I can only imagine y'all cracking up as you were taking them. 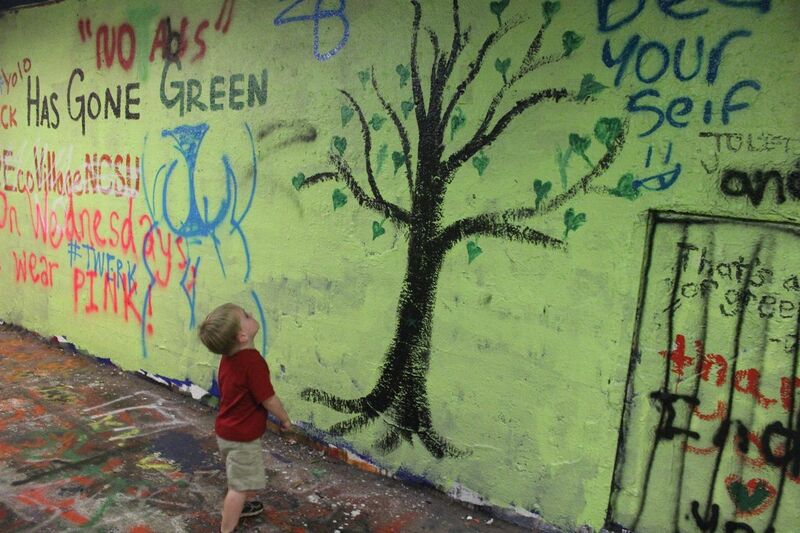 I love Brody's appreciation for art. He's too cute! 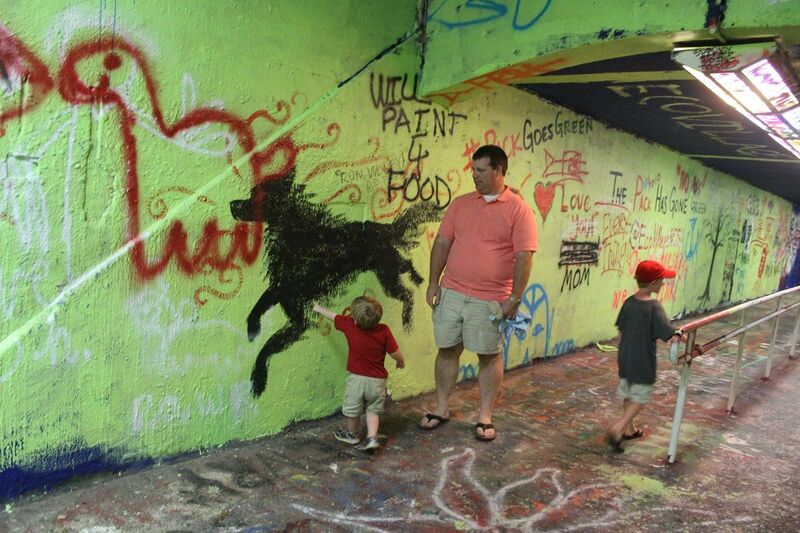 The art tunnel is cool! 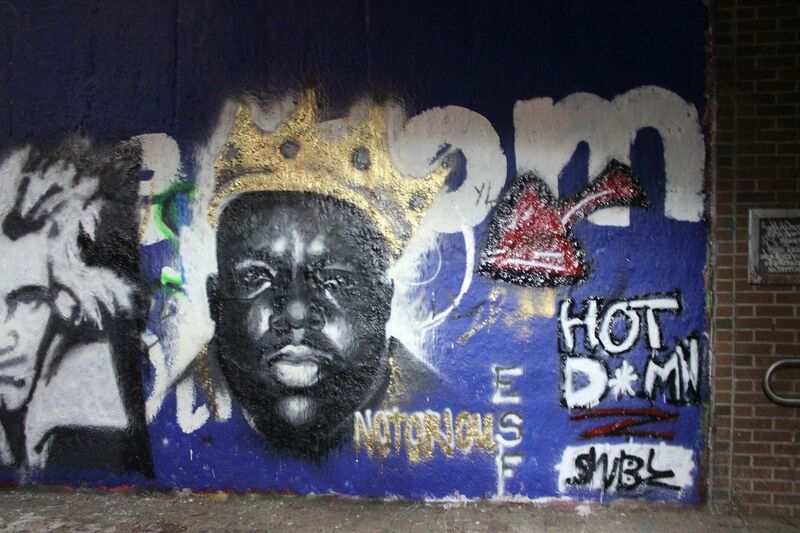 It's amazing how talented people are with a little spray paint. 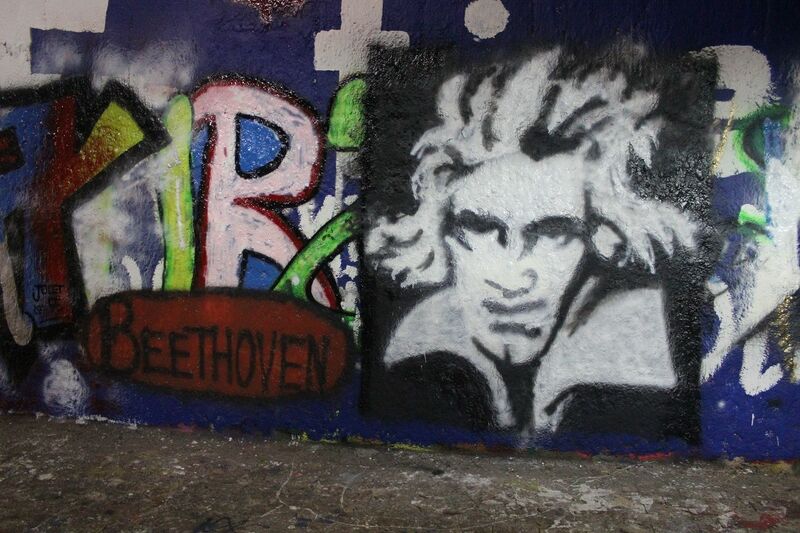 This makes me want to take the kids to my college campus. 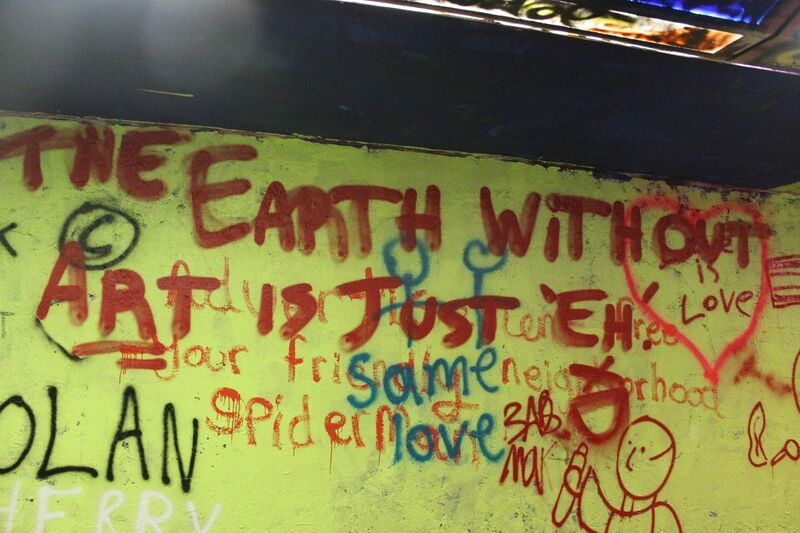 Maybe the next time we go back home! Ohhhh... 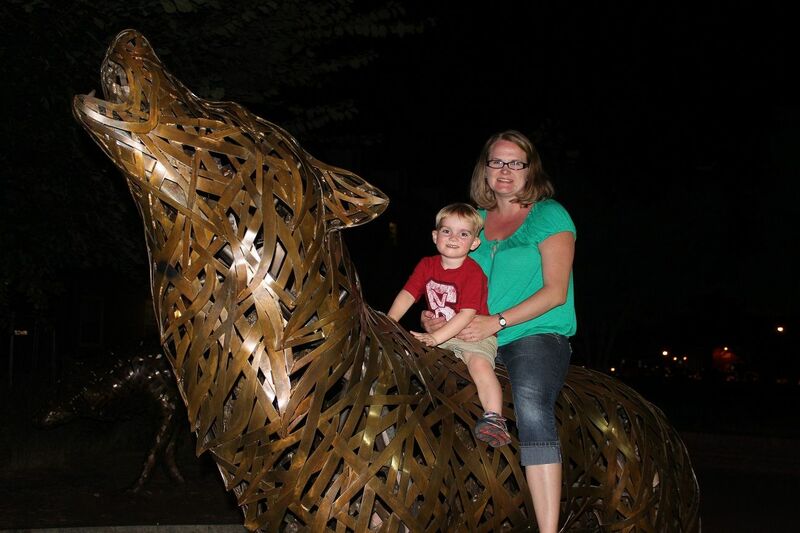 I want to read the blog post where the police came and hauled you off the wolf statue! 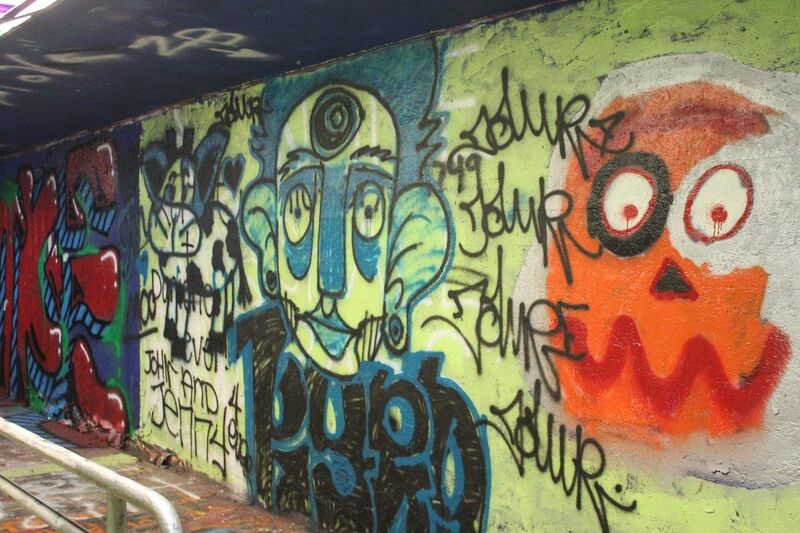 And I love the art tunnel. Very cool. 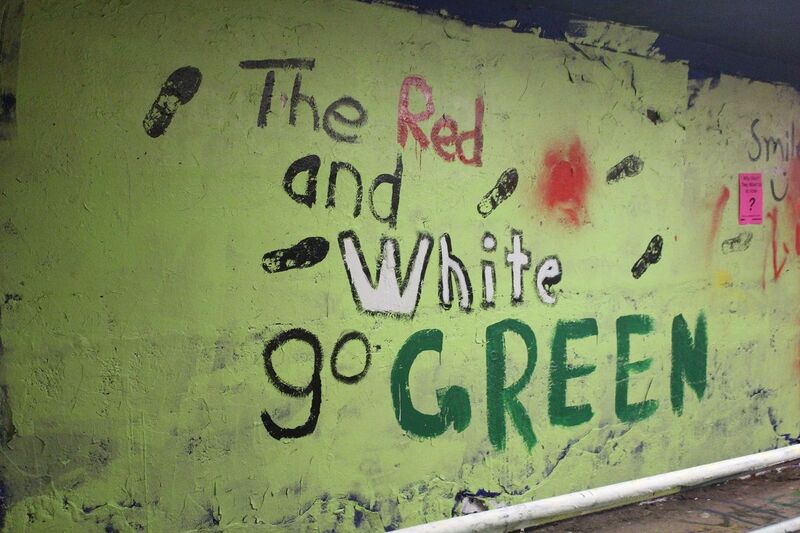 And this reminds me that we need to take the kids to our alma mater. What a fun visit. So you think my next post is about our night in jail, Natasha? Haha! I went to Meredith too! (class of 2001). 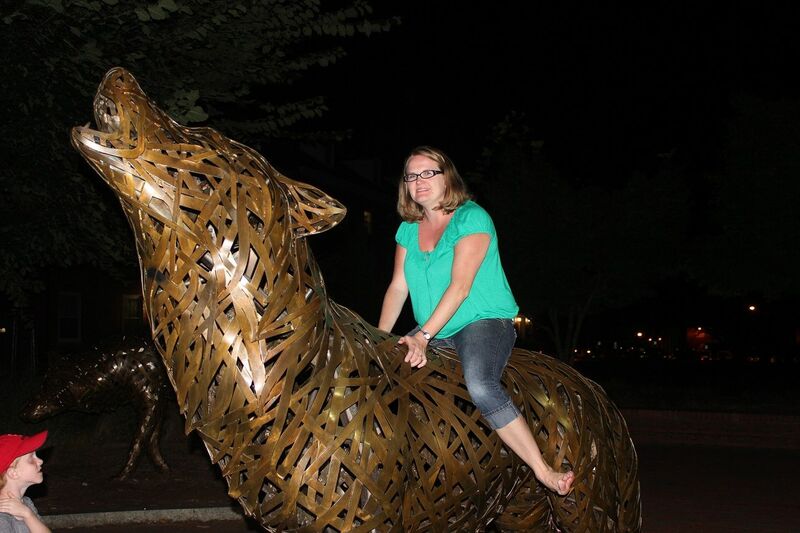 Met my husband at NC State. :) Maybe our boys will end up marrying Meredith angels. :) Have you ever taken your boys to the Cornhuskin parade? I took our kids last year and they loved it! Yay for Meredith girls! I don't think I knew that. I really do miss reading about you on your blog! It was so random how I found you looking for another person's blog with your last name in NC. I wish I had known you at Meredith. I was class of 2003. You were a baby in those last two pictures! Great flashback pictures. Have you ever explained to me why we were in such different college graduating classes when are a year apart in age? I have a feeling you did, but I have forgotten. I graduated from high school in '97 but was always the youngest in my class because my b-day was after the Sep 1 cut-off. If my parents hadn't had me tested into kindergarten I would have been the class of '98. And then I graduated from college in 3.5 years so I was the class of '00. 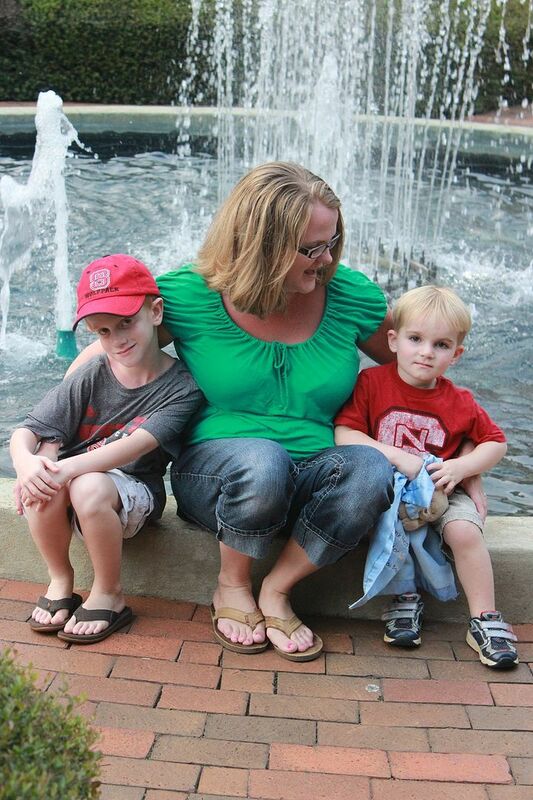 It's awesome that you took the boys for a college campus tour. 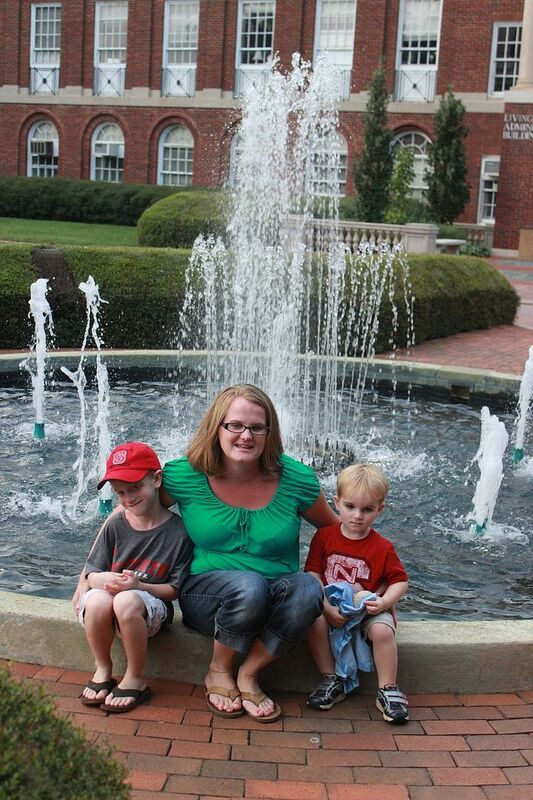 We have taken Spencer to the U of A a couple of times (both Michael and I graduated from there), but not Elliott yet. Maybe this fall.